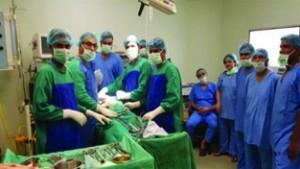 A woman with 203 stones in her gall bladder was successfully operated upon in ESIC Hospital, Bari-Brahmana, Jammu. A woman namely Rani Devi (name changed), resident of Chak Murar, district Samba, had come to ESIC Hospital Bari Brahmana in March 2017 with complains of acute abdomen pain and was diagnosed with acute Cholecystitis with Cholelithiasis. Subsequently, she was followed up in the Surgery OPD of the Hospital and was taken up for surgery on July 13. Surprisingly, 203 gall bladder stones were retrieved from the patient’s gall bladder. The surgery was undertaken by Dr Nadeem Niyaz Jan, Consultant, Department of Surgery and Dr Sunil Kumar Verma, IMO, ESIC Model Hospital, Bari Brahmana, Jammu. The success of the surgery was equally contributed by efficient team of anesthesia headed by Dr Tilak Raj, Consultant, Department of Anesthesia, Dr Sonica Dogra, IMO and Dr Wasim Chouhan, Senior Resident, ESIC Model Hospital, Bari Brahmana, Jammu along with the OT and paramedical supporting staff, the hospital said in a press release. Doctors said the surgery was indeed a challenge as it was difficult to lift and remove the gall bladder as it was heavy, but it was done successfully. The patient is doing fine and will be discharged after full recovery.